LIKE ALL CITIES of any size, Wellington has its share of little streets that never entered into the calculation of any early city planning. For various reasons Wellington has more than its share of little streets. The original town sections were cut with so lavish a hand - one acre apiece - that it was not to be expected, as business interests multiplied, that they would remain undivided. Hence in the early business area there is to be found a welter of lanes, alleys and small ways that arose with little restriction, especially in the long interval (1841 - 1870) before the city became a municipality. It was not indeed until December 1st, 1917 that a Sub-division Act gave the Council power to approve of the size of sections. Another factor that made for numerous little streets consisted in an Empowering Bill which, very early in the history of Wellington, permitted the construction of private streets forty feet in width. Nor are such streets confined to business areas. The very steepness of the surrounding hill faces is conducive to short cuts. "Any two sides of a triangle are together greater than a third" is the unconscious maxim of Wellington pedestrians, and its practical application has criss-crossed the city heights with steps and short cuts in every direction. Since such smaller streets have so largely arisen from the cutting up of private property, they are mostly named after the vendor or members of his family. In business areas these secondary streets are mainly short cuts, fire-breaks or rights-of-way into closely built areas of industrial premises, but in the residential parts they may vary from delightful sun-traps in some hitherto inaccessible spot to congested approaches to crowded dwellings, devoid alike of a right and proper share of sun, space or solitude. Commencing with C.1 and setting out from the Monument (this sounds like a London expedition) we find, constructed on reclaimed land on the harbour side of the Quay, a number of busy well-planned shorter streets whose importance has warranted discussion of their origin elsewhere. On the inner side of the Quay, however, little streets are few in number, as the business premises here back against the cliff face of the Terrace behind. The first such opening is Mason's Steps, originally a track up the cliff to the Terrace over a section owned by W. Mason, who on its south comer set up one of the first smithies of the settlement. Curiously enough, the occupant of the north comer, a draper, was also W. Mason. They were both early pioneers. Not far along, on the north side of the lofty Wairarapa Farmers building, is Farmers Lane which blossomed into recognition at an early date of the city's history as York Lane, a city record (August 25th, 1881) stating: "That the right-of-way opposite York House from the Terrace to Lambton Quay be designated York Lane." Later it acquired the name of Tokio Lane,(1) very appropriate in the Great War, but equally inappropriate in the succeeding one. Wherefore, for diplomatic reasons, "Tokio Lane" was again disecreetly changed (July 16th, 1942) to Farmers Lane. The imposing adjoining block, the Wairarapa Farmers, at the time of its erection the loftiest building in Wellington, was built for Mr. Jacob Joseph in 1881 on the site where he had previously carried on business in a wooden building, living himself in an adjoining house. Subsequently a son, Mr. Joseph Joseph, conducted the business, after which the building was let to Walter Nathan and Company and Kempthorne Prosser. In 1905, three years after the death of his father, Jacob Joseph, Joseph Joseph, who was President for some time of the Wellington Club, sold the premises to the present owners, the Wairarapa Farmers Cooperative Association. The fund for "Jacob Joseph Scholarships," bequeathed by Jacob Joseph to Victoria University College in 1905, has benefited many a well-deserving student. A third short cut from the Quay to the higher ground behind is to be obtained by the use of Plimmer's Steps (q.v.) approached by the Dominion Avenue, the former site of the "Dominion" newspaper offices. Adjoining Dominion Avenue is Barrett's Hotel, a modern structure with an old name. It is part of the Plimmer Estate, but any connection of the name of Plimmer with hotels must always recall to earlier residents the Royal Albert Hotel, demolished in 1929, one of the most interesting structures of the past, which John Plimmer (1812 - 1905) built in 1879 at the corner of Willis and Boulcott Streets on the site of the present Hotel St. George. Its interest, historically speaking, lay in the carved heads of the old identities which adorned the centre of each window arch of the building, and which caused it to be universally referred to as the "Old Identities Hotel." These heads are at present reposing in the cellar of the main Public Library - another argument for the foundation of an Early Settlers' Museum. The carvings, which are said to be excellent likenesses of contemporary public men, are variously spoken of as the work of George Booklass, an 1875 arrival by the "Avalanche," or of Giuseppe Bernasconi, two of an active band of carvers working here in the seventies. The latter, born and trained in Milan, had first settled in London, where he was engaged in making the highly decorative piano cases of the day. Prom London he journeyed in 1870 in the "Halcione," to Wellington and established in Cuba Street, opposite the White Swan Hotel, a business in all classes of woodwork, specialising in the making of violins in which he was most highly proficient. There was much demand for such work. Victorian ornamentation was at its height, and the furnishings of the period - what-nots, overmantels, brackets, mirror-frames, tables and chairs - were of little account unless highly decorated. Sidney Bath was another Wellington carver in business in Courtenay Place, on the site of the present Ford Buildings. He had a windmill for motive power, and did much to ornament the city, within and without. Yet another carver was John Adair - so fast a workman, say old woodworkers, that he "could supply 4 x 4 Red Pine carved mantel brackets for 5s. 6d. a pair." Later on, in the eighties, one of his apprentices, Mr. Hendrickson, set up in Lower Dixon Street and did much of this work, attracting attention by the boldness and simplicity of his style. Other times, other ways. The carving community is no more. They played their part and moved off the stage. But they were mostly craftsmen of a high order, as often as not, true artists, drawn to expressing themselves in one of the loveliest of all mediums, that of wood. Not a moneymaking section of the community. "My father," writes the son of one of the best of them, "was always carving, but he never made much money. He just seemed to be wrapped up in the beauty of it." To such the world will always be in debt. Giuseppe Bernasconi was a fine artist in wood. It is to be regretted that the city possesses no acknowledged samples of his work. In 1871, for inlaid woodwork, he was awarded the Gold Medal at the London Exhibition. Entering Willis Street, half way along to the left is Chews Lane, a traffic alley commemorating John Chew, an early resident of Ngaio, who had a timber yard on the north side of the lane. Further on is Bond Street, a new name now given to Old Customhouse Street, visited at times, not only for business purposes, but to view the former premises of Bethune and Hunter (1841) the oldest business quarters in the city. Church Street consists of a series of steps connecting Boulcott Street with the Terrace, and was at one time always referred to as "Jacob's Ladder," a picturesque name now discarded because of its similarity to Jacobs Place (C.3). The church in question, St. Mary of the Angels, is one of the handsomest of the city churches, which in 1916 replaced an earlier church destroyed by fire, and this in turn the tiny church built in 1842 by Father O'Reily, the first Roman Catholic Church of the settlement. In the vicinity of Boulcott Street are several other small streets of historic interest. Close to the church is Ellers Avenue, which takes its name from Martin Eller, who arrived in New Zealand in 1873, and in 1884 passed on from Hokitika to Wellington. He too was a maker of furniture, one of the fine craftsmen of past days, and carried on business in a shop in Willis Street, a little to the north of Edward Anderson's china shop (now Wardells), at that time the finest china shop in Wellington. Boulcott Avenue and Boulcott Terrace are two further offshoots of the parent street. Allenby Terrace is the present name of the old "Harbour View," at one time an oft-recurring and easily comprehended Wellington street name. Passing into Manners Street, several small but important streets whose origin has already been given - St. Hill Street, Farish Street, Lombard Street, Cornhill Street - come debouching in on the left, all busy short cuts between the harbourside area and the main artery of Manners Street. On the right is Herbert Street (q.v.) connecting Manners Street with Dixon Street, and half way along it is found what is possibly our most Lilliputian thoroughfare, a spot where the proverbial cat could get at least three good bumps. This is Edward Street, constructed in 1853 by Edward Catchpool. A nephew of E. B. Hopper (q.v. ), he reached Port Nicholson by the "Oriental," January 31st, 1840, and in 1843 was residing nearby in Dixon Street, close to the residence of Mr. Geo. Hunter. Mr. Catchpool had a three-storeyed brick flour-mill in Willis Street working as early as October 1841, a steam-mill taken to the Colony by Dr. Evans and said to have been the first steam-mill erected in New Zealand. It is strange that in these ever-changing back parts of the city Edward Street has endured so long. So many city lanes have been overbuilt, as for instance, Port Lane and Martin Lane nearby. Doughty little street! When the time comes, may the Mayor in full canonicals descend upon you to bestow his thanks for one hundred years of unremitting service. One might add the councillors as well, but it would be a tight squeeze. Mention of Martin Lane recalls an early comer, Mr. Robert Martin, combined descendant of an Irish baronet (2) and an English vicar, who after an early training in art, found himself beginning life in the young settlement on the shores of Port Nicholson. Impressed with the paucity and lack of taste of such interior furnishings as were available, he imported a shipment of wallpapers etc., and met with such success that the firm of R. Martin, thus founded, was for several decades the leading firm of interior decorators in Wellington. His third daughter, Mrs. Chas. Carter, was an enthusiastic supporter and one of the founders of the Early Settlers' Society. At the corner of Herbert Street and Manners Street are the premises of Mr. Brittain, chemist, which are unique from the fact that since the forties they have never been used for any other purpose. The original shop, octagonal in form, and so tiny as to be called "The Pill Box," was built by C. D. Barraud as a branch of his main business in Thomdon. Mr. Barraud sold the pill box to his assistant, Mr. A. H. Orven, and after changing hands to Mr. Poster, and later to Mr. Pritchard, it was bought in 1876 by H. Brittain, an arrival from Birmingham, via Auckland, who, in addition to his professional qualifications, was an expert organist. At present (1948) the "Te Aro Dispensary," as the business has long been called, is under the direction of A. J. Brittain II, assisted by C. H. Brittain III. Yet another chemist's shop, at the comer of Willis Street and Manners Street, gives its name to "Perrett's Corner," after C. H. Perrett, who purchased the premises in 1912. Mr. Perrett, Senr. had come from Bath and after a preliminary sojourn on the West Coast, made his home in Wanganui, where he died in 1917. Pringle Avenue, formerly an entrance to Segar's Foundry, is a private way giving access to the back of the establishment of Jas. Smith and the Plaza Theatre, and was so named in 1921 by Mr. Jas. Smith after the owners of the Wilderness Works, Clerkenwell, London, Wholesale Manufacturing Jewellers, of whose family Mrs. Jas. Smith is a member. Off the end of Manners Street is Luke's Lane, named not after either of the city mayors, Sir John or Sir Charles Luke, but after their father, Captain Luke, who reached New Zealand from Cornwall in 1874 and later established the well-known foundry, Luke & Sons. Manners Street marks the confines of C.1 and turning back we retrace our steps by a more westerly route along Wellington Terrace, a name changed since 1911 simply to "The Terrace." Reaching it by way of Dixon Street, we first pass on our left Eva Street, a tiny street whose name origin, lost in the mists of time, goes back to 1865, when George Oates Greenwood, father of George Dean Greenwood, the noted Corriedale breeder of Canterbury, sold part of the section, excluding the street, to John Matthew Taylor. Next comes Howe's Lane, which commemorates a well-known family of early pioneers. Mr. Howe's house in this locality, a two-storeyed brick and wooden building, was badly injured by the 1848 earthquake. Higher up to the right is Percival Street, constructed in 1878 by Thomas K. Macdonald and named after his Sydney partner, Mr. Percival Johnston. Round the corner and we are on to the Terrace, branched right and left with little old mellowed residential streets - Terrace Gardens, more terrace than gardens; Flagstaff Hill (entered from Willis Street), an important spot in early days, where in 1843, in fear of native attack, a battery mounted with two 18-pounders was erected. Athol Crescent, Glencoe Avenue, and Everton Terrace are names said to have been suggested by Thomas Kennedy Macdonald, a Scotsman born in France. At No. 4 Everton Terrace, lived Mr. Joseph Parker, son-in-law of Mr. Macdonald and from 1917 to 1940 Editor of the "Evening Post." The grounds of the residence run down to a gully where may still be seen a remnant of the native trees that once so densely clothed these parts. Through the gully the Kumutoto stream found its way, turning down the present Woodward Street, under which it still runs, to the sea. Continuing along the Terrace, Rosina Terrace (q.v.) is one of our women streets. Sieverston Terrace commemorates Wm. Sievers, a well-known pioneer farmer of early Wellington and Makara. Higher up the slopes are the three "Spanish ways" - Salamanca Road (W.I), Talavera Terrace and San Sebastian Road (q.v. ), while Clifton Terrace, Aurora Terrace and Bolton Street are reminders of three of our very first ships-masthead climbs, especially Aurora Terrace and Bolton Street, but bosky ways for all that, particularly in early summer with its tender deciduous greens. The best way to appreciate Bolton Street is to view it from one of the upper storeys of Kelvin Chambers, and mark the double row of ascending red-tiled houses, snuggling comfortably into the softening clumps of intervening foliage. So pretty! Opposite the foot of Bolton Street, on the site of the present Car Service Station, stood for many years a well-known Girls' School, kept by the Misses Greenwood. After their retirement they built a large house, still standing, next to the school on the Terrace, and remained there to the close of their days. Few women did more in their time to direct the minds of young Wellington pupils to whatsoever was right and true and of good repute than these daughters of Dr. John Danforth Greenwood (1803 - 1890), M.R.C.S., who, albeit a medical man, was the first inspector of schools in Nelson, and from 1863 to 1864 Principal of Nelson Boys' College. Mention of the influence of the Misses Greenwood recalls that of another of Wellington's "great" teachers, Mrs Henry Smith (née Miss Mary Galway) who in 1883 reached Christchurch where her brother, Canon Galway, was for a while the Vicar of Riccarton, and after teaching for some years in the Cathedral city, she came to Wellington to share the control of Fitzherbert Terrace School with its owner and co-director, Miss Mary Swainson. This was for many years the leading girls' boarding school in the city, and large numbers of girls passed through the Spartan hands of these two cultured women to emerge the better able to cope with life's problems and perplexities. In the evening of her days Mrs. Henry Smith, in order to be near her beloved grandchildren, retired to Khandallah, where her tiny cottage, so filled with memorials of her long and honourable career, was a Mecca for all, ex-pupils or not, who sought solace and advice from the great stores of wisdom that seemed hers to give in great and greater measure as the years passed by. Educated in England and Germany, Mrs. Smith was one of the ablest literary scholars and critics that the city possessed, and like her cousin, Charles Kingsley, ever an ardent humanitarian. To Miss Mary Richmond, the founder of the Wellington branch of the Free Kindergarten, she was a tower of strength, and one of the memorials to her work may be said to be the model Kindergarten Playroom, erected by her past pupils in the grounds of the Taranaki Street Kindergarten. Another is to be found in the Library of Chilton St. James School at Lower Hutt. A third - and greatest - is the shining example of service to one's fellow men that she passed on to posterity. Nor must we forget the educational services rendered to the community by the Misses Spinks, who for thirty years (1849 - 1879) kept in operation a school, first in Dixon Street, and later in Willis Street, in a house still standing behind St. John's Church. It is to be regretted that no street name commemorates such long and faithful service. Two recent additions off Bolton Street are Easdale Street, and Kinross Street, cut through the property of the late Sir James Prendergast, C.J. (1826 - 1921) and taken over by the City Council in 1925. A much more hoary offshoot of Bolton Street is Mowbray Street, named for a former headmaster of Thorndon School. This leads us into Bowen Street, at the foot of which is our goal, the Monument. Hard a-port is the Railway Station. Twenty minutes to one's own roof-tree! Another day! Hath prospered here my home. C.2 is a large slice of the city extending roughly from Taranaki Street to Taitville, and running north and south from Mount Street to Nairn Street Reserve. It caters for all sorts, furnishing on its western side some of the city's finest homes, on its eastern some of the best city shops, and in between and around shops and houses to suit all tastes and all purses. Residentially speaking, it has been hard hit by the development of the outlying suburbs and the advent of the motor-car. Time was when in the neighbourhood of Upper Willis Street and its environs many a fine mansion was reared by prosperous city magnates, but such folk have long since buzzed away to distant suburbs, and the "big houses," shorn of their guardians and gardens, now stand, the victims of impersonal hosts of flatters and roomers, somewhat pathetically awaiting their dissolution. 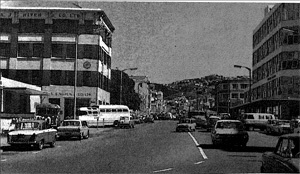 The most important thoroughfares of C.2 - Cuba Street and Willis Street running north and south crossed by Ghuznee Street, Vivian Street, Abel Smith Street, Webb Street and Hankey Street, running east and west-are all "Company Streets," bearing names of much historic interest already discussed elsewhere. To come to smaller streets, off Ghuznee Street is Egmont Street, a name changed in 1911 from Little Taranaki Street. It is easy to derive the new name. Further west is Sturdee Street (see Ship Streets), known to earIier residents as Quin Street, after Morton Quin, one of the members of the City Council elected for 1870-71, before this again as "Maori Row,"" and still earlier as "Sutton Row." The next change is surely overdue. Whittaker Street, misspelt for Whitaker, bears the name of Sir Frederick Whitaker, an ex-premier of the Colony. It was formerly known as George Street. Almost opposite is Buller Street, constructed by Dr. Buller (created K.C.M.G. 1886) who in February 1879 applied for leave to form a private street so named, and in the same year leave was also granted to Mr. Parker to form the neighbouring street of Windsor Place. Next to Buller Street is its diminutive, Little Butler Street, and next again Cumberland Place, another "royal" name selected when the name of this thoroughfare was changed from Victoria Place. Watson Street, dedicated in 1873 by John Rees George, was constructed across Town Acres 110 and 112 of which the original purchaser was John Watson, who figures as a director of the New Zealand Company in the list of directors, August 3rd, 1844. Between Dixon Street and the Terrace lies McDonald Crescent, constructed in 1878 by Thomas Kennedy Macdonald, who has left his imprint on the names of so many secondary city streets, while off Mount Street (by no means a misnomer) runs McKenzie Terrace, a reminder of one of the first printing patriarchs of the town, Thomas Wilmor McKenzie. Leading off Vivian Street is DunIop Terrace, until 1925 known as Crawford Street, a name which commemorated, not one of the Crawfords of Miramar (see Part III), but George Crawford (1810 - 1880), merchant, who owned land on the eastern side of the street. As one of the earliest pioneers, Mr. Crawford had reached Wellington from Glasgow in the "Bengal Merchant," and after some mercantile experience, went into partnership with a shipmate, Alexander Yule. For twelve years Mr. Crawford represented Wellington on the Provincial Council. He was a champion rifle shot, and gave generous assistance to all forms of sport. It is to be regretted that, in the general readjustment, his name had to be deleted from city streets. The name "Dunlop" was appropriately selected in 1925 by the City Council in commemoration of the Rt. Hon. Henry Dunlop, who became one of the original holders of Wellington town acres by the purchase in London in 1839 of Town Acre 790. Another offshoot of Vivian Street is Marion Street, constructed, on the application of Dr. Martin, at a later date than its sister thoroughfare, Jessie Street, but also named after a daughter of the Hon. John Martin. Knigge's Avenue commemorates Mr. C. Knigge, who owned the New Zealander Hotel. Clayton Avenue, constructed in 1880, is named after W. C. Clayton, a well-known builder and contractor, who in the eighties and nineties built numerous houses (mostly to one pattern) and lived himself at the corner of Clayton Avenue and Vivian Street. Walter Street records Mr. Walter Shirer, a large property owner residing at Oriental Bay, and Peter Street, close at hand, is a somewhat dignified name for a private back city lane giving access to a group of small houses on Town Acre 149, the title to which, at present vested in "Reckitts Blue," was formerly held by the late F. W. Hales of Plat Point, Wairarapa. No record of any mortal Peter has as yet come to light, but considering the proximity of St. Peter's bells, it may be the saint himself who is thus commemorated. The name first appears on a plan in 1888. Binham Street was so named by an old resident of these parts, Captain Kreeft, grandfather of the Rev. C. R. Kreeft, Vicar of Khandallah. Captain Kreeft called the street after the English village of Binham in Suffolk. One slender city record informs: "March, 1885, a four-inch main has been laid in Binham Street." Bute Street was named presumably by William McLeod Bannatyne, who bought this section from various Dixons, and sold portions, leaving the street so named. Other than the main cross thoroughfares already noted, there are few small streets branching off Cuba Street. Swan Lane runs along the south side of Wakefield Hotel, for many years known as the White Swan Hotel, though affectionately and incomprehensibly called by many clients of the past, "The Dirty Duck." Speaking of ducks, George T. London, a first arrival, who in the early days conducted a grocery store in Cuba Street and also owned a paddock and coaching stables for the Porirua and Pahautanui traffic, acquired a further piece of land in this street for his daughter, who stipulated that she was to be able to keep ducks. The necessary water was no obstacle, for a creek, rising in Polhill Gully and entering the sea behind the Opera House, crossed Cuba Street at the corner of Ghuznee Street where, owing to the proximity of Mr. London's property on the eastem side, the bridge across it was known as "London Bridge." "There!" the old man would sometimes exclaim, gazing at the dense traffic and closely packed buildings of modern days, "Once my duck farm." Mr. London was for many years on the Wellington Education Board, and was for several terms Mayor of Petone. The Bristol Hotel, which he built, now covers part of the "duck farm." His son, George London, is a recent Mayor of Petone. The derivation of Garrett Street is doubtful. A chemist of that name had his place of business at the corner of Taranaki Street and a Dr. Wm. Garrett arrived at Wellington in the ship "Gertrude" in 1841, practised here for a few years and returned to England in 1848. There is, however, no Garrett Street in a plan of Wellington, 1875. At the head of Cuba Street is Tonks Avenue, a reminder of the city interests of a well-known pioneering family of that name. Almost opposite is Arthur Street, named after another member of the family, the son of William Tonks. 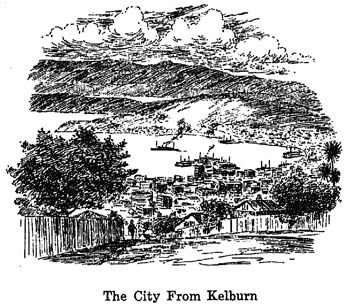 The latter, who reached Wellington with his parents by the "Birman" in 1842, had much to do with fashioning the early contours of the city and in 1886 carried out the first important city reclamation of thirteen acres, extending from Panama Street to Waring Taylor Street, at a contract price of £ 24,732. He also acquired much city property including a large block in upper Cuba Street, where he established extensive brickyards, and another in Melrose, transmitted in 1922 to the Public Trustee, who sold to Dr. Truby King in 1927. In his later days Mr. Tonks himself retired to Melrose, where his daughter, Mrs. Duff, still owns the old homestead. Another son gives his name to Frederick Street (C.3). From 1872 to 1875 Wm. Tonks was one of the lessees of the Queen's Wharf. Some of the oldest Cuba Street businesses were those of the Misses Smith, on the site of Te Aro House, who later sold out to a draper of the same name but no relation; D. Kinniburg, painter and glazier; W. H. P. Barber, dyer; W. J. Gandy, grocer; Edward Dixon, cordial manufacturer, and J. Tolley, locksmith and bell-hanger, all interspersed, rus in urbe, with commodious paddocks, in fact the shop and dairy of E. Bannister was flanked by cowshed and bails. Happy thought! No transport involved. A large paddock behind the Nag's Head (burnt down in 1879 and re-erected as the Alhambra) was used for horse auctions, which frequently provided an extempore circus for the small boys of the neighbourhood. In later days real circuses often pitched their tents in "Johnny Martin's ad dock," a large vacant field between the south side of central Vivian Street and Ghuznee Street. A military touch was added to Cuba Street by the residences of Major Paul (65th), Major Turner (65th) and Sergeant-major Grigg, military storekeeper at Mount Cook. Finance was served by the presence of Mr. Edward Miller, a future manager of the Wellington branch of the Bank of New South Wales, conviviality by the Nag's Head and the White Swan, and subsequent renovations by Dr. France, whose house and surgery stood in a fine flower-filled garden between those of Mr. Kinniburg and Sergeant-major Grigg. Dr. France had arrived in Wellington in 1854 by the "Norman Morrison" and became one of the best known of the city's early medical men. From Abel Smith Street runs Kelvin Grove, named afer the suburb of Glasgow where the university is situated, though the Glasgow version of the name is usually spelt in one word. Kensington Street also runs off Abel Smith Street. It was constructed by Mr. H. Crump through the former estate of T. J. W. Gale, and was named after W. C. Kensington, I.S.O. (1845-1922), a former Under-Secretary for Crown Lands. Opposite is to be found Crosby Terrace constructed over a section cut up and sold by Hugh Gully in 1897, when lots 4 to 13 were purchased by Thos. Crosby Peers, whose name was given to the ensuing street. John Abel Smith, whose name is given to the main thoroughfare, Abel Smith Street, was a director of the New Zealand Company, and in the original plan of the city, dated August 14th ,1840, the name is recorded as John Abel Smith Street. Lying on the confines of the business area of the city, Abel Smith Street was in the early days a secluded and favourite residential quarter for many of the city's prominent families. Here lived Colonel Reader, whose great elm, planted at his front gate in 1874, still grows in beauty with the years. Later the house was occupied by Colonel Pearce. Near by lived H. D. Crawford, son of Wellington's first settler; the Blundells, founders of what still remains the city's leading daily paper; the Collector of Customs, Mr. Wm. Seed, on a rise at the end of the street known as "Seed's Hill"; the Moginies, the Vennels, the Rowdens, the Jobsons, Archdeacon Stock in St. Peter's vicarage, the Noble Campbells, next to the vicarage. Down an avenue between the Noble Campbells and Mr. Blundell's was a residence used as the first Girls' High School of Wellington. Basin Reserve, Wellington College and over the hills to Rongotai, Evans Bay , Lyall Bay, Seatoun and the Heads. Modern Taranaki Street, now a wide and important city thoroughfare. Thomas Bloomfield Jobson was Australian born and had come to New Zealand from Victoria in 1870. In Abel Smith Street he purchased the Bowling Green and Tennis Court on which he built a spacious residence still occupied by his daughters, and at the side of which he constructed in 1886 Footscray Avenue, so named after the Melbourne suburb of his youth. Mr. Jobson died in 1935 at the age of eightynine. Another familiar figure of these parts was "Seed's donkey," which had probably been one of the "Lighthouse Donkeys" employed by the Marine Department on parts of the New Zealand coast in order to carry oil and stores from the beaches to the light houses. A donkey for this purpose was in use at Mana Island, and after this light was closed down (September 24th, 1877), was transferred to Pencarrow. Such donkeys were mostly bred by Mr. Chamberlain at Ponui Island, Hauraki Gulf. Branching off Upper Willis Street is Palmer Street, which calls to mind the owner of another spacious residence of these parts, erected for William Henry Palmer, who acquired the land in 1870 from John Martin, and designed by Mr. Clayton, the Government Architect, who had just completed the "new" Government House at the Thorndon end of the city. Like the vice-regal residence, Mr. Palmer's house was adorned with a tower, and in consequence was often referred to by local residents as "Little Government House." With its gardens and lawns traversed by the meandering Wai-Mapihi Stream, its conservatories, stables and tennis court, it was a source of much aesthetic satisfaction to the locality. Later it was occupied by Mr. Morrah, a city bank manager, whose eldest daughter, Miss May Morrah, M.A., was one of the first duxes of Wellington Girls' College, and subsequently a much-esteemed member of the College Staff. Today the grounds, intersected by Palmer Street, are thickly overbuilt and the residence itself has been transformed into a Presbyterian Men's Hostel. Almost opposite, at the corner of Webb Street, stood a residence of a very different type, still notched in the memory of some of the oldest residents through the sheer melody of a name - a low, weatherboard cottage, the "Cottage of Content," inhabited by an old one-legged philosopher, Bamford by name, cabman by profession, whose old squarish cab and old angular horse were, in those pedestrian days, much in demand. Branching south from Webb Street is Torrens Terrace, formerly known as Broadway Terrace, which brings to mind Colonel Sir Robert Torrens (1814.1884) one of the founders of South Australia and an early member of the New Zealand Association. He was also one of the earliest purchasers of Wellington town acres and in legal circles is best known as the originator of the Land Titles Registration Act, which inaugurated the so-called "Torrens Title" in use in the Dominion today. The upper reaches of Willis Street and its vicinity harboured in early days the homes of many of the leading mercantile families of the city - the Kebbells, the Andersons, the Kirkcaldies, the Dransfields, the Nicholas Reids, the Blairs, to say nothing of prominent early members of the medical profession, notably Drs. Harding, Chapple, Rawson, Tripe, Gillon, Fell, Ewart. Among literary figures were the poet-premier, Alfred Domett, the Rev. de Castro, John Blundell, editor of the "Evening Post," and Thomas McKenzie, founder and editor of the "Independent." Like many other residential parts of Wellington, it was a fine community of pioneers in every sense. For the most part they had passed through a sound apprenticeship in the Old World and they brought to their new home a wealth of experience and adaptability such as seldom falls in such unstinted measure to the lot of any settlement, old or new. Not that they all prospered materially. Far from it; but they passed on to posterity a shining tradition of courage and endurance that runs like a silver thread through all the early struggles of the Colony's beginnings. No greater band of men and women ever crossed the sea than the Company emigrants of the forties, bound for the shores of New Zealand. If you seek their monument, look around. Nairn Street is one of our steepest streets, running up at a sharp angle to Nairn Street Park. It is an old Company street, dating from 1840, and takes its name from Sir Alexander Nairne, (with an 'e') one of the Company's earliest directors. Off it runs Fitchett Avenue, called after A. B. Fitchett, who farmed cows on a large scale in the neighbouring district, and Staunton Avenue, named by a resident chessplayer after the famous English chess champion of the mid-nineteenth century. Hopper Street recalls an early pioneer, Edward B, Hopper (q.v. ), head of the engineering and mill-wright firm of Hopper, Petre and Molesworth. Off it runs Sidey Street, so named from Mr. Francis Sidey, an auctioneer, who in 1876 erected Sidey's Arcade, with frontages to Manners Street, Farish Street and St. Hill Street. The Arcade was designed to include office premises, shops on the Manners Street frontage and a large central hall for assemblage purposes. The hall became a great rallying-point for temperance orators, also a popular place for political meetings and sporting fixtures such as boxing matches and walking events. From Webb Street runs Evelyn Place, named for John Portescue Evelyn Wright, an early arrival and descendant of the diarist, John Evelyn. On the outskirts of C.2, adjoining Taitville, is a group of streets which owe their origin and naming to an early settler and land speculator, Mr. William Adams, whose boyhood had been passed in the Old Country at Landcross Farm. These are Adam Terrace, Landcross Street, Devon Street, Essex Street, Durham Street, and in the same neighbourhood, Semelof Terrace, constructed by Mr. Jacob Semeloff. Included in this area is also the district of Mitchelltown, approached by Aro Street, which follows the old bullock track by means of which heavy wood was brought from the Karori bush in the early days. 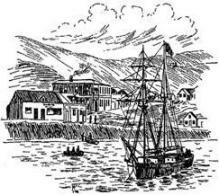 It consists of land formerly owned by Henry Mitchell, who with his parents and brothers, William and James, arrived at Port Nicholson in the ship "Gertrude" in 1831. For some time Mr. Mitchell, who spent all his life in Wellington, was in the grocery business with W. J. Gandy, at the corner of Cuba and Ingestre Streets, but subsequently purchased and farmed a considerable amount of land between the head of Aro Street and Karori. He sold a portion of his farm in 1872 to the City Council for the first storage reservoir and later cut up the remainder to form the suburb of Mitchelltown for which he himself selected the street names. His two brothers, whom he survived, were well known in early days as the proprietors of brick works in upper Willis Street. At one time William Mitchell built and was licensee for ten years of the Royal Tiger in Taranaki Street. Henry Mitchell, who first saw the light of day in Yorkshire in 1833, died at the residence of his nephew, Frederick Mitchell, in Abel Smith Street, February 19th 1913. In Mitchelltown, overlooking Central Park, is to be found the Ohiro Benevolent Home, now known as the Central Park Hospital, opened January 28th, 1893. The grounds are spacious, consisting of one acre freehold and four and a half acres leasehold from the City Council. Central Park, which it overlooks, grows year by year more bosky and beautiful, and Archibald Nicol's picture of Wellington, taken from this spot, is one of the happiest canvases the city possesses. It hangs in the National Gallery. C.3 is frankly proletariat. If you are in doubt, go and see. This part of the city runs up from the wharves, taps a busy shipping and commercial area, and then passes into the old Te Aro Flat, whose expanse of flax and swamp was one of the early problems of the settlement. Te Aro Flat is still a problem - of another kind. 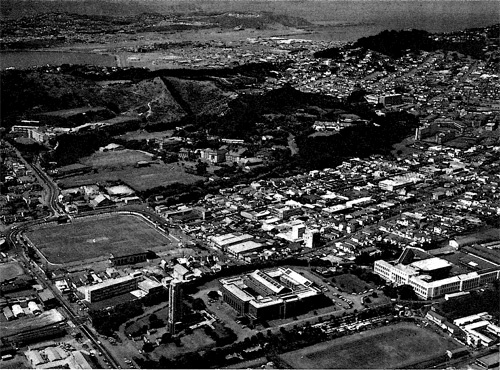 The site of the present sports ground, the Basin Reserve, the great oasis of C.3, was at first a shallow lagoon, destined by the early designers of the city for a dock. Access to it was to be obtained by widening and deepening the stream that ran down between Cambridge Terrace and Kent Terrace to the sea, where once boys in "flatties" punted at Spring Tides from the present Courtenay Place tram stop up the creek to the "Basin." The dock idea was never to materialise. Fifteen years later (1855) an earthquake happened along and raised the land sufficiently to put any such thoughts out of the question. At the harbour edge are several busy shipping streets - Cable Street, Barnett Street, Chaffers Street and Herd Street (see Ship Streets) all constructed on reclaimed land and linked up on the inner side by Wakefield Street (named for the Great Founder) along which swirls a constant stream of vehicles bearing exports and imports to and from the wharves. Inwards again from Wakefield Street run four more busy thoroughfares - Blair Street and Allen Street commemorating City Fathers and Tory Street and Taranaki Street oldtime historic names. 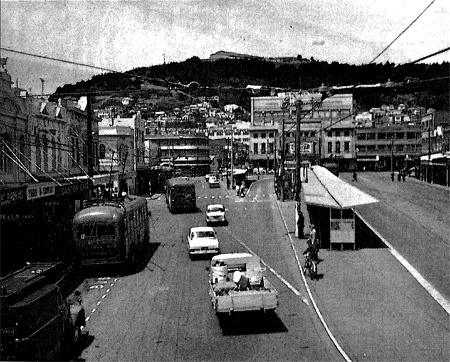 All four lead into Courtenay Place (q.v.) today one of the finest business and shopping centres of the Dominion, whose metamorphosis from a street of mixed houses and small shops dates from the extension, forty years ago, of the electric tram service to the southern and eastern suburbs. The remainder of C.3 consists of the old Te Aro Flat, bounded east and west by Cambridge Terrace and Taranaki Street, rising in the south to higher land, somewhat ambiguously termed "Mount Cook," and crossed by a number of small congested streets, which, if reports be true, have caused many a headache to cogitating councillors. To some extent time is working the remedy, since, with increasing transport facilities, outlying districts are developing for residential purposes, leaving increasing areas of the flat available for modem factories and industrial depots. Not that these little streets were always "unfashionable." By no means. Time was when they harboured not a few trim homes and trim householders who could look out across their breakfast tables at smiling pastures and browsing kine. Industry takes its toll. Shipping more than most. Where are these remaining little streets? Off Taranaki Street, on the sea-side of Courtenay Place is Halley's Lane, which bears the name of John Halley, timber merchant, who died in 1900. He had his timber yards in Courtenay Place, opposite what is now St. James Theatre. These extended to the water-front, where there were placed large gates up to which the vessels came to unload their timber. Another of Wellington's leading timber firms of early years, which exists today as the Stewart Hardware Co., was the Stewart Timber Co., founded by Messrs. Greenfield and Stewart in February, 1865, on the site of the present King's Chambers, and moved in the same year to Courtenay Place. Earthquakes were then recent enough memories to make a heavy demand for timber, and many a scow dumped its freight of precious kauri logs into the water at the Courtenay Place foreshore to be towed ashore, to the delight of the small boys of the neighbourhood at seeing moving pictures enacted on the spot. Off Tory Street branches Jacobs Place, so named by Mr. Jacobson, a builder and landowner in the locality, and Ebor Street, cut up by the owner, H. D. Edwards, who came from York and gave the classical name of that town, Ebor (Lat., Eboricum) to the street. Next to Jacobs Place is Holland Street opening up a section cut up and sold in portions, excluding the street, by Messrs. Andrews and Parkes in 1875 - 1877. The origin of the name is undetermined (3). Jessie Street was constructed by the late Hon. John Martin, who in May, 1883, applied for leave to construct a private street between Taranaki and Tory Streets. It was named after his daughter. That is why in the re-casting of names, Jessie Street (N.5) was changed to Baroda Street, city names taking precedence over suburban. Frederick Street is called after the son of Mr. William Tonks, an early pioneer, who at one time owned much land at this end of the city. The next small street is Haining Street, constructed on part of Section 230, City of Wellington, originally granted on the 12th day of July, 1854, under the hand of Robert Henry Wynyard, C.B., administering the government of New Zealand and the public seal thereof, to one, John Haining. A search of the Crown Grant from which the title is issued revealed that the grant was to John Haining, gentleman, Crown Terrace, Mayfield Road, Dalston, Middlesex, England, and when the street was laid out, the surveyor probably named it after the original grantee of the section through which it runs. John Haining apparently did not come to New Zealand. His name certainly did. Next to Haining Street is Martin Square, named after the Hon. John Martin (q.v.). At the back of the Square lie (1) Sages Lane, so named from Mr. G. C. Sage, a sailmaker who reached Wellington from Masterton in the seventies. In Tory Street he commenced a Sunday School which was afterwards taken over by St. John's Church and held in Mt. Cook School; (2) Tory Place, after the parent street; and (3) Frankville Terrace, after Mr. Frank Buck, who resided here and owned most of the houses. Gray Avenue was over a grant of land to George Gray in 1860, and the street seems to have appeared in 1880 to give rear access to the land. But if parts of C.3, through the march of time, have become unbeautiful, there is one spot that, after ministering to everyday city needs for well nigh a century - even to the incarceration of its erring sons (4) - has emerged, so to speak, as the city Acropolis, upon which has been reared, as a memorial to fallen New Zealanders, an Antipodean Parthenon, one of the most beautiful structures - some would have it the most beautiful - the Dominion has to show. This is the National Art Gallery and Museum which crowns the so-named Mt.Cook, and by its very strength and beauty seems to epitomise, as for the Athenians of old, the end of the struggle that left the Empire once more fearless and free and filled with pride. Before it stands a lofty Carillon of fretted stone, whose bells likewise commemorate the "sacred gift," and at whose apex bums unceasingly the Lamp of Remembrance. Yet lovely as they are, truth compels the admission that neither have completely fulfilled expectations. The Gallery and Museum is too distant from steamer or railway termini to be conveniently reached by passing visitors, or for that matter elderly local pedestrians, and carillon music is certainly not adapted to such a hill-beset spot as Wellington. It is doubtful if many have heard directly one chime from these beautiful, misplaced bells. At the back of the National Gallery is Hill Lane, whose houses were built and owned by the Hill family whose bricks form parts of many a building in the locality. The Hill brick works were in Rolleston Street and presided over by Mr. Herbert Hill, potter and brick manufacturer, who had arrived on the "Alma" from his birthplace, Southampton, in 1857. Another large brickmaker in Taranaki Street was Mr. W. K. Murphy, accidentally killed in April, 1905, by the falling in of one of his ovens. Another was Mr. Peter Hutson who in 1891 bought out the Hill Bros., and for many years conducted brick and pipe works on a large scale. Mr. Hutson had first reached Wellington in 1872 per the ship "Christian McAusland." In spite of earthquakes, brick-making was one of the earliest industries of the settlement. As far back as May 23rd, 1840, the local newspaper announces: "We are happy to state that brick-making has commenced at Thorndon. Messrs. Sinclair and Millar have employed a number of hands who are busily engaged." Two of the brothers of Henry Mitchell, William and James Mitchell, arrivals by the "Gertrude" in 1841, were engaged in such work. William Tonks had large brickworks at the top of Cuba Street. He had arrived by the "Birman" in 1842 and commenced business in 1847. Many were made on Mt. Cook by prison labour (5) in short, with its timber intake at the foot and its brick output at the head, the city in days past depended almost entirely upon the Flat for most of its building supplies. Today we live in an age of Big Business, and local brick-making has coalesced under the control of of an Amalgamated Brick and Pipe Company, whose managing director, Mr. R. J. Murphy, carries on the family traditions. Passing across to Cambridge Terrace, the opposite boundary of C.3, and proceeding south, Foresters Lane is a reminder of the old Foresters Arms, now the Dominion Hotel. Close at hand are Lorne Street and Argyle Street, which recall the Scotch son-in-law of Queen Victoria, the Marquis of Lorne, and his father, the Duke of Argyle, an active promoter of pioneering emigration from Scotland. "'Tis a proud man you'll be the day," said one of the Dukes' tenants, "with your son wedded to the daughter of the Queen." " 'Tis a proud woman the Queen should be getting into the Campbell family," was the quick reply. The first street branching off Cambridge Terrace at the Harbour end is fittingly named Alpha Street. It is one of our early private streets and was part of the two original town acres (283 and 284) owned by Mr. Lipman Levy and subdivided by the owner in 1873. Throughout the seventies he sold portions to various people, giving a right-of-way which subsequently developed into the street so named. Another little way is College Street, at one time a popular and exclusive residential quarter, now the home of busy factories and business premises. It went through an educational reserve, College Street in S.1 being in consequence re-named in 1911. Lynn Road is a reminder of W. R. Robinson, who arrived in 1853. In Cambridge Terrace, where College Street now runs, he leased two acres for dairying purposes, and on the south side of Vivian Street he purchased two more. Here he put through a street called Cambridge Avenue, altered in 1926 to Fifeshire Avenue (see Ship Streets) and later he constructed a right-of-way to his house which stood back from the road, naming it Lynn Road after his village home (Lynn) in England. Across the creek, then dividing Kent Terrace from Cambridge Terrace, Mr. Robinson erected wire swings for the conveyance of his milk. Rural days! The local newspaper (January 11th, 1848 ) advertises that oats for sale "newly cut and unthreshed, may be seen upon the field, Te Aro Flat." Passing on, Francis Place perpetuates the memory of the Hon. Francis Fraser, M.L.C., an ardent temperance worker who for many years resided here. Barker Street was cut up by Mr. John Pattinson between 1880 and 1883. Crossing Buckle Street we arrive again at the Basin Reserve that has been such a joy spreader to these parts, and which but for the grace of an earthquake, might have been merely a moneymaking dock. 'Tis an ill wind that blows nobody any good. 1. There is a York Street in C.3. 3. Holland was a family name of William Andrews, who bought Town Acre 253 in 1857, and must have cut Holland Street through it. His great-grandaughter said there have been Holland Andrews in each generation of her family. (Information supplied by A.H. & A.W. Reed, 28 April 1976). 4. From 1879 to 1903 Mt. Cook Gaol crowned thin eminence. A still more prominent beauty spot accommodated the Borstal Institution until 1942. 5. Mt. Cook was declared a prison July 10th, 1879, and closed as such May 1st. 1903 but until 1920 prisoners made bricks here and were marched each day from the Terrace Gaol to the brickyards.